Mayo Clinic Alumni Association | Ali Alikhan, M.D. 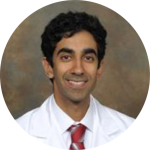 After completing his residency in dermatology at Mayo Clinic, Ali Alikhan, M.D. (DERM ’13), joined the dermatology staff at the University of Cincinnati, where he is director of clinical trials, co-director of the residency program and clinical assistant professor of dermatology. He’s about to embark on another new chapter — moving to the Sacramento area in California, where he’ll join a large multispecialty dermatology practice. I work as a dermatologist at the University of Cincinnati while my wife is finishing her residency in dermatology here. On the academic side, I’m working on many projects, including national treatment guidelines for hidradenitis suppurativa with other dermatologists from the U.S. and Canada. This disease can be devastating and has only recent been gaining a lot of attention from the medical community. I recently published a dermatology review book, Review of Dermatology, with Thomas Hocker, M.D. (DERM ’12, DSURG ’14), who I met in residency at Mayo and who practices in Kansas City, Missouri. For a short time, it was Amazon’s best-selling book in dermatology. We’ll begin working on the next edition hopefully later this year. On the personal side, my wife and I have a 19-month-old baby who has just started nursery school and is a handful. What’s life like with a baby and a two-physician family? It’s challenging. It’s like having two jobs — one at work and then another one at home. The baby requires our full attention all the time. Having a child is life-changing and even more so with two working parents. We certainly have less time for hobbies and leisure, but it is incredibly rewarding. We are so fortunate to have such a wonderful child. We also have an amazing nanny. This has allowed me to continue being productive at work despite having a rambunctious baby boy at home. Why are you moving to California? I’m from California and have a large family. While I love my job, I miss my family, and it will be wonderful to be closer to them. Furthermore, it will be so nice to have more help with the baby. My wife and I will be at different group practices. We have tried to choose job situations that will provide a good work-home life balance. We are hoping to be able to spend a lot of time with our son and each other. My wife has many interests, including music (she is a trained opera singer), and hopes to have time to pursue some of these interests post-residency. I love sports and eating out (both fine dining and great ethnic foods) and hope to do a lot more of both when we move. It is nice to finally see the light at the end of the tunnel. It took a while. I finished medical school as my wife started. I finished residency as she started. We have a nice life in Cincinnati but are excited to get back home and spend time with family. There’s nothing more rewarding than seeing someone start residency knowing little about dermatology and, over three years, seeing how far they’ve come. Teaching and working with residents also helps keep me sharp and up to date. I’ll miss it but hope to get back into it in some capacity. I’m most proud of my residency training at Mayo. I went on many interviews for dermatology residency, but Mayo was my top choice. Many of my co-residents are now my closest friends. I had a lot of opportunities at Mayo, and my department treated me really well and allowed me to cultivate my interests. I still keep in touch with several of my teachers and ask them questions about dermatology, life and career. People think very highly of Mayo Clinic, and it’s warranted — it’s the best hospital in the country. People who haven’t been there ask me what it’s like: “Is it as great as everyone says?” I tell them it exceeds the hype. It’s at least as good as you think it is. If I or my family ever needed care, we’d go there in a heartbeat.